From the 29th August to the 9th September 2012, the world gushed with pride whilst as many as 4,200 worldwide Paralympic Athlete’s wowed us with their amazing sporting talents. With this fresh in the heads of many, what better time to address the issues of disabled job seekers? In 2009 it was reported by the Office for National Statistics that there were ‘1.3 million disabled people in the UK who are available for and want to work’, so why are they unable to find work? Is there still biased towards those with disabilities, or is it simply that those seeking work with disabilities just do not know where to look? We are told not to judge a book by its cover, so surely this should be of relevance when it comes to disabled job seekers and employees. Shaw Trust, an employment service for disabled and disadvantaged people said, ‘Often society can disable people more than health condition or disability, with attitudes and assumptions preventing people from reaching their work-related goals.’ If this is the case, then not only are employers preventing disabled job seekers from finding work, but consequently they themselves could be missing out on the perfect candidate for a job. Evenbreak, a not-for-profit social enterprise who match ‘employers who value diversity with talented disabled clients’ also explored the issues disabled job seekers face. Aside from the obvious physical barriers disabled job seekers face, Evenbreak also expresses other obstacles both job seekers and employers might experience such as ‘Lack of confidence around employing and managing disabled people, and a fear of “getting it wrong” ’. This showing that employers aren’t necessarily being biased when it comes to hiring those with a disability, but in fact suggests that maybe there is not enough support out there on how to address what could appear a touchy subject. With the right tools and support, this need no longer be an issue. 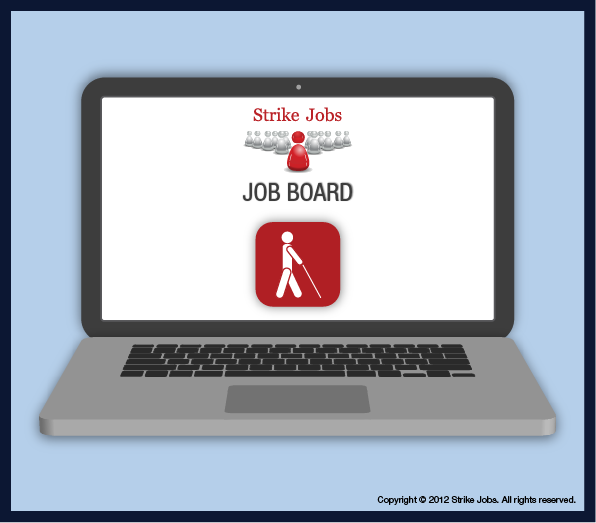 Unique and forward thinking Global Online Generalist Job Board, Strike-Jobs are now the first job board to integrate disabled and non-disabled workers. Their simple three minute CV upload process is perfect for today’s fast-paced lifestyle, the site itself is a pleasure to use in terms of simplicity and best of all it is completely free. “Disabled job boards work well to attract disabled workers and do a huge amount of positive work. If we can also help to build the bridge between disabled jobseekers and corporate organisations worldwide this can only serve to decrease the unemployment numbers and build successful lives.” Says Suzie Tobias, Managing Director of Strike-Jobs. This entry was posted in General Posts and tagged disability, disabled, job board, job seekers, JOBS IN UK, recruitment, upload cv, video cv, work. Bookmark the permalink. ← Why the Video CV will take over the world!